I loved designing clothes when I was a little girl, and The Pea is just like me. Whether it's drawing designs on paper or cutting up bits of paper to drape on paper dolls or pinning scraps of cloth to make a cape for Barbie and American Girl, she can spend hours dreaming up all kinds of outfits. 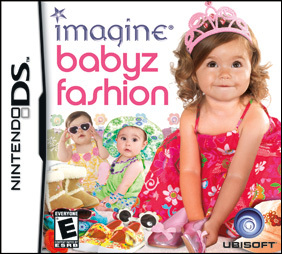 Recently Ubisoft sent us three Nintendo DS games from their popular Imagine girls' series to help The Pea satisfy her clothing design cravings. Imagine: Fashion Designer World Tour, Imagine: Fashion Designer New York and Imagine: Babyz Fashion differ in storyline and characters, but they all allow girls to pretend they are fashion designers and let them design all kinds of clothes. I'm happy to let her play these games because they a fun addition to her clothes design play, and she gets to exercise her creativity and imagination. Imagine: Fashion Designer World Tour follows the adventures of a young Hollywood fashion designer -- the game player -- who wants to create her own label and take it global. To do that, players have to create seasonal collections and promote them via runway shows and fashion shoots. At the end of the season, players must meet a minimum sales target (which serves as a "score") in order to move onto the next season. It's all a bit complicated to me, and involves quite a lot of dedicated play (which is kind of difficult for The Pea when she gets limited screen time and has to choose between so many games to play! ), but there are also some mini-games that players can complete in a short timeframe. Anyway, The Pea is too preoccupied with creating clothes and dolling up the models with hair and nails and makeup and accessories to pay too much attention to the overarching storyline at this point. I really like how this game incorporates the features of the Nintendo DSi. For example, you have to blow into the game console's microphone to dry your model's nails! Another really cool feature is the ability to use the DSi's camera to take photos of things and use them in the clothes you design. Do you adore that shade of pink in your grandmother's rose garden? Use it to tint the bolt of cloth! Or take a photo of your own lovely lips and use it as a pattern for the next miniskirt you create! You can also use the DSi's wireless feature to share the garments you've created with your friends (they need to have their own DSi and Imagine: Fashion Designer World Tour game plugged in). 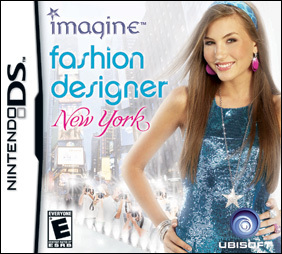 Imagine: Fashion Designer New York is a lot like the World Tour version (it was actually released before World Tour) in that the player creates their own fashions for fashion shows and photo shoots. The story is slightly different: in this game, the player is a novice fashion designer who joins a fashion house in New York, and the goal of the game is to become a great fashion designer. Players get there by completing tasks and challenges such as selecting models, dressing models and putting on a fashion show. Completing the tasks increases the player's experience level and unlocks more style options and fashion advice, which in turn help the player complete more challenging tasks. Throughout the introductory section and tasks, girls get the fun of choosing clothes, designing clothes, and deciding on hair, makeup and accessories. It's a bit more basic than the World Tour version, but there's' still more than enough to entertain girls. In Imagine: Babyz Fashion, the stars of the runway are cartoon-y toddlers. You can design outfits for them and dress them up and choreograph their catwalk performances. I really like the part where you can choose the baby's dance moves and choose the music they walk down the runway to (anyone remember the Ally McBeal dancing baby? ), but I have to admit, the concept of babies toddling down runways and entering fashion contests kind of creeps me out. I know it's all a simulation, but it smacks too much of that icky JonBenet Ramsey, Toddlers and Tiaras, infant beauty pageant world. I much prefer the part of the game where you have to feed and play with the baby, which is something that all girls like to do, even the older ones. They just won't admit it -- so caring for virtual babies lets them play mommy-baby and still maintain their cool girl facade. 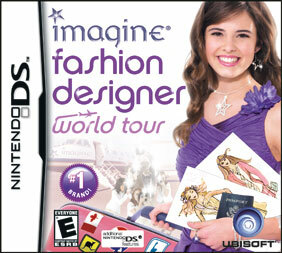 One lucky Bonggamom Finds reader will win their own Imagine: Fashion Designer World Tour game for Nintendo DS. To enter, go to the Ubisoft Parent's Corner and take their Perfect Gift Quiz. Then leave a comment on this post and tell me which Ubisoft game(s) the quiz recommended for your child. This entry must be completed before any extra entries will count. 1) Grab my blog button and post it up on your blog (leave a comment with your blog URL). 2) Subscribe to Bonggamom Finds updates by email (leave a comment with your email address). 3) Fave Bonggamom Finds on Technorati (leave a comment with your Technorati id). Maximum of 5 entries per person. This giveaway ends at midnight PST on December 16, 2009; I will draw a winner at random on December 17 and post the winner's name as soon as the winner confirms acceptance. For additional giveaway rules, click here. Good luck! I received a sample in order to review this product, but no monetary compensation. The views and opinions expressed here are my own. The quiz recommended Imagine Soccer Captain, Jam Session 2, and Imagine Music Fest. The quiz said that this one would be best: Petz Fashion: Dogz & Catz. And I do agree! She all ready wants me. It is so unfortunate that a little girl who was tortured, raped and murdered will forever be known for that very small segment of her life that constituted her pageant activities. She fingerpainted, kept a gerbil, ran, played, sang, danced. Nothing "icky" at all about her. The quiz matched up my daughter with Petz Dogz Family...good choice. imagine detective and cloudy with a chance of meatballs were choices for my kids!! Imagine Zookeeper!! Thanks for the chance. Liz's perfect gift is the Imagine Detective game. They said Petz Dogz Family for my son. This was the match up. The quiz results were Imagine Sweet 16, Fairyland Melody Magin, and Style Lab Makeover. I am looking into those ones right now! I am subscribed. Thanks again. I think these suggestions are right on the money! Mine was Petz Horseshoe Ranch, animal ranch and sandle club. I have favored your blog via Technorati as jsc123. It came up with Petz Dogz Family as the number one game, thanks! Imagine Zookeeper would be the perfect gift for my daughter. I don't have children, but I have a stepsister who'd love this, so I took the quiz with her in mind! My top result was Imagine Music Fest. Thank you for the giveaway! It recommended Imagine Artist for my daughter which would be perfect. lol Thanks for the giveaway! The quiz recommended Imagine Music Fest, Petz Dolphinz Encounter, and Fairyland Melody Magic. Which all look really cool! They recommended Petz Dogz Family. The quiz recommended Sweet 16 and Sleepover Party. Thanks for the chance to win! Thank you for taking the Quiz. Here are some games your child might like. The quiz recommended Petz Dogz Family. I loved designing clothes when I was a little girl, and The Pea is just like me.